On Nov 11, 2004 collective Lakshmi pujan was performed in traditional manner by devotees at Sri Ashtalakshmi Bhavan. 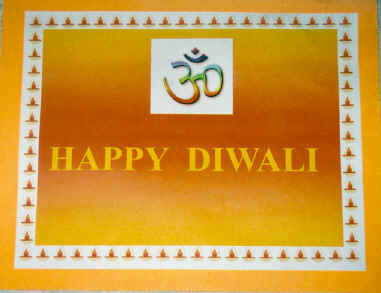 On Nov 12, 2004 (Diwali Annakoot) offering to Maa Ashtalakshmi of more than six hundred food items prepared by devotees. More than four hundred devotees taken the prasad on Diwali day at the Ashram. Next day about twelve hundred packages of dry prasad were made and distributed to daridranarayas. 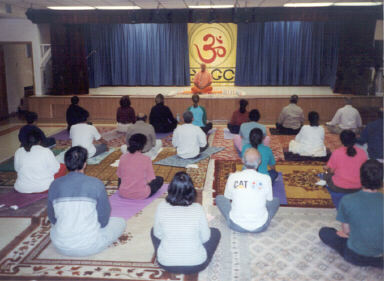 On Nov 22-24, 2004 three day lecture series were jointly taken by Smt. Rupa Majmudar, Sri.Tapan Mankodi and Smt. Punita Kaushal for National Environmental science Academy, New Delhi and Gujarat Council on science and Technology, Gandhinagar's training program on dealing with Disaster, stress & cure through Yoga. On Nov 22, 2004 Smt. Rupa Majmudar gave a lecture on the subject of "How to relax while working" at Sardar Patel Institute of Professional Administration. Sri Manhar Udhasji, a poet and singer visited the ashram, worshiped at Lord Sri Vishwanath Mahadev. Also had a darshan of Holy Ashta Lakshmi Mataji and Chidananda Dhyana Mandir. Spreading the message of Holy Master Sri Swami Sivanandaji Maharaj and to live by it, is the constant preoccupation of Sri. 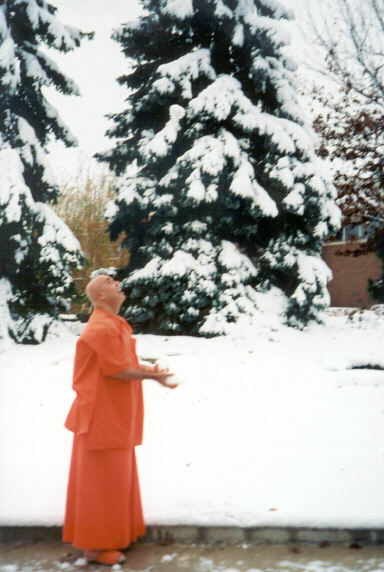 Swami Adhyatmanandaji Maharaj. His Life and each breath have been dedicated to spread the ancient wisdom of Yoga and Vedanta through simple and practical teachings of Gurudev Sri. 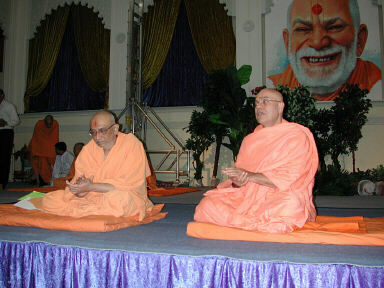 Swami Sivanandaji Maharaj and Gurumaharaj Sri.Swami Chidanandaji Maharaj. Wherever he went, he talked about the simple message of Sri. Swami Sivanandaji Maharaj- “Serve, Love, Meditate & Realize” and guidelines of daily Sadhana through Gurudev’s “Twenty Spiritual Instructions”. Devotees welcomed him here in the west for his simplicity, sincerity and love for teaching Yoga way of life. Report by Sri. Ravi Ponangi. Swami Adhyatmanandaji’s Yoga classes reverberated in Atlanta: Free Yoga classes conducted by Swami Adhyatmananda from Nov 4 – Nov 8 attracted many and the way Swami taught yoga to participants still reverberating in the minds of all participants. Young, old and children from all walks of life participated in these yoga classes enthusiastically. People from diverse nations and cultures attended these classes in big numbers as the Atlanta based news daily; Atlanta Constitution journal had published a story on yoga with Swamiji’s bio just before Swami’s arrival in Atlanta. Hence yoga has caught up in a big way with the people of Atlanta. Dr. Prakash Desai, facilitator of Swamiji’s yoga classes said to India Tribune, as a result of publication in Atlanta constitution, there were five to six missing calls while answering a call from one yoga enthusiastic. Experienced a very hard time to attend phone calls received from people who wanted to attend these yoga classes, Dr. Desai added, there was overwhelming response, he said. 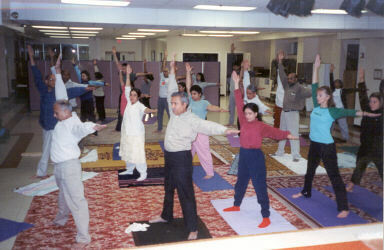 Each day, morning and evening couple of hundreds that include house holders, office goers, doctors, lawyers and business men throng to the five day free yoga classes conducted by Swami Adhyatmananda set up at two locations one at India Cultural and Religious center, Smyrna in the morning and another at Global Mall on Jimmy Carter in the evenings. Participants had immersed themselves in learning and practice of yoga. Sri. Sai Sailendra inaugurated five-day free yoga classes by lighting a traditional lamp at Global Mall on Thursday, Nov 4. Swami Adhyatmananda while addressing the participants said that yoga is not a religious thing. Even while explaining the benefits of chanting OM , Swamiji said that chanting of OM would benefit to calm and energize the mind. In this no religion is involved. No doubt it has come from ancient Rishis of India. Swamiji said that it is only through Yoga that one can attain mental and physical balance.Swami Adhyatmanandaji’s yoga classes included flexibility exercises, yogic postures, breathing exercises, relaxation methods, Surya namaskar postures, practice of meditation, Pranayama etc. Candle light meditation by all participants was the high light on the concluding day. Many participants told India Tribune that swamiji’s teaching of Yoga is filled with many useful tips and enjoyed the way he took yoga classes with anecdotes. It’s a wonderful experience and we are fortunate to get this opportunity, they said. Swami Adhyatmananda visited Shree Shakti Mandir at Lake City and given a spiritual discourse. Swamiji has also visited Hindu Temple of Atlanta at Riverdale and addressed 200 strong children and exhorted them to cultivate virtues and eradicate vices. Swamiji sang Swami Sivananda’s famous song “Ramakrishna Govinda, Don’t smoke Govinda, It will spoil Govinda, Krishna Rama Govinda” in chorus with children. The song attracted the attention of both parents and children attended the meeting. Swamiji has also visited the local Sri Swaminarayan mandir where he was received with honor. Swamiji has addressed about 600 devotees of Swaminarayan samstha and spoke at length about Swaminarayan movement and the importance of living to ideals of Pramukh Swamiji maharaj. He also briefed his association with Sastryji Maharaj, Pramukh Swamiji and others. Swami Adhyatmananda has also met visiting Buddhist monks in Atlanta . Hindu Temple of Greater Chicago hosted Rev. Swamiji’s seven days Yoga Camp in the morning 6.00am to 7.30 am. It was attended by a large number of yoga enthusiasts including yoga teachers of all nationality. This time Swamiji not only took preliminary flexibility exercises for the beginners but also taught advanced Yogasana postures, Pranayama including Sivananda Pranayama, Yoganidra, and Meditation techniques in detail at the request of others who are well advanced in the yoga field. The program was extremely well received and very much appreciated by all participants. In the evening Swamiji’s discourses were organized at various organizations namely, Hari Om Mandir, Sri. Gayatri Parivar, Sri. Arbindo Kendra, Swathyaya parivar and Indian American Cultural center. As always, welcome satsang was held at Spiritual Life Foundation, Oak Brook. Swamiji spoke on various subjects stressing the importance of a life of moderation and daily Sadhana. It was a special Diwali time and all were in festive mood. An artist in Swamiji created a beautiful rangoli. That was a special treat for us. On Saturday, the very first day of a new year (Indian calendar), Swamiji took part in a Grand Annakoot darshan and Aarati at Sri. Swaminarayana Mandir (BAP’S). Swamiji’s one week stay here was completely filled and hectic with home visits, home satangs, visit to ailing and sick devotees etc. 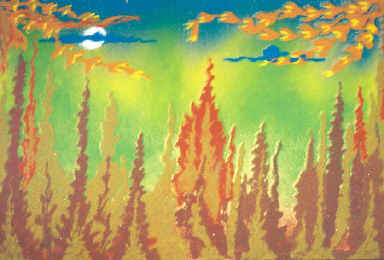 The day began at 5.00am till 11.00 pm on most of the days. It has been also a challenge for the host to keep up with his energy level. 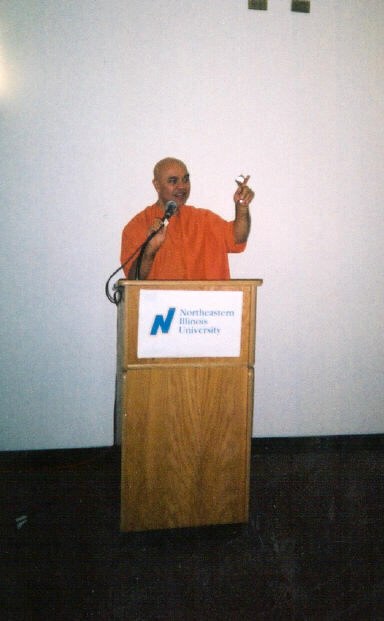 Swamiji was invited to preside over two day long Yoga –Philosophy conference organized at Northeastern University in Chicago and gave the keynote address. It was attended by a group of faculty members of the university, including the dean and the head of the department of Philosophy. Last day satsang was a special feast for devotees in the form of an hour long soul stirring Kirtan by Swamiji. Chicago, being anchor and hub of his visits to the United States and Canada since 1995, people of this great city have special love and regards for Swamiji and he does not need formal invitation for Chicago. Widely read “India Tribune” newspaper carried an article about Pujya Swamiji and his mission of spreading the message of Holy Master Swami Sivanandaji Maharaj. On Nov 15, 2004 upon his arrival Smt. Bhavani sarkar, Sri.Shantanu Sarkar and Sri Pareshbhai Patel welcomed Swamiji Maharaj with flowers and garland at the airport. Evening satsang and Padpuja were performed by Bengali Samaj at Smt. Bhavani and Santanu Sarkar’s home. 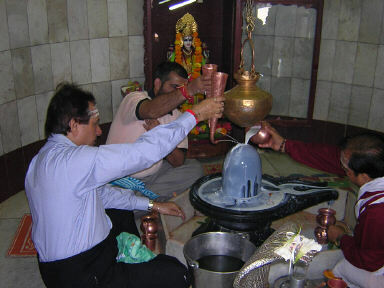 On Nov 16, 2004 a grand Satyanarayan pooja, archana, satsang and Bhandara were organized at Sri. Paresh Patel’s home. Swami Sivanandaji’s literature, jnana prasad, was distributed to the large gathering. During the two-days stay here, Swamiji was invited at many devotees homes and businesses for his grace and blessings. On early morning of Nov 17, 2004, Rev. Swamiji departed for Los Angeles for a week long program. Thanks and congratulation to Smt. Kalpana & Dr. Sri. Vinod Rana, Smt. Sachi & Dr. Hemendra Rana, Dr. Rajendra Rana, Dr. Smt. Surekha Vashi and Sri. Bhikubhai Patel, President of Sanatan Mandir for organizing the programs at Los Angeles . After a day’s break at Chicago, a last stop of this trip in USA, Sri. 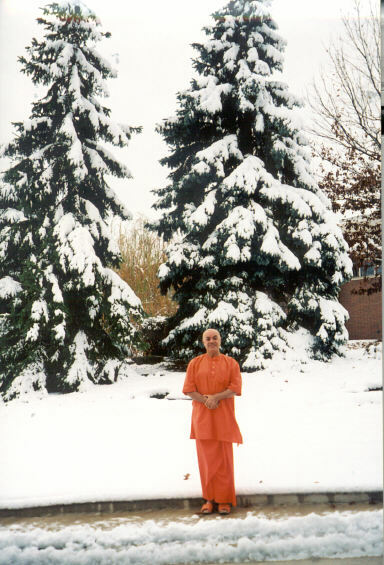 Swamiji departed for UK on Nov 26, 2004 . As always, at Chicago Swamiji received warm welcome, even nature joined by spreading white welcome carpet in the form of first snow fall of the season on Nov 25, “Thanks Giving Day”. Holy "Tulsi Plant" was brought by Swamiji from Los Angeles and planted by him at the last minute before going to airport and fulfilled the wish of mother of the house. Many thanks for that. On Nov 27, 2004 Sri. Swamiji was welcomed by devotees of Anoopam Mission, “AMUK” at Heathrow airport. On Nov 27 & Nov 28 i.e. Saturday and Sunday satsangs, house visits were organized at number of places namely at Anoopam Mission, Sri. Jalaram Temple on the occasion of 205th Jalaram Jayanti and famous Sri. Swami Narayana (BAP’s) temple. Large numbers of devotees hailed Rev. Sri. Swamiji and listened to his discourse at Sri. Swami Narayan Mandir. Swamiji’s unity in diversity and equal reverence for all saints, sages, cast, creed and people of all walks received a great admiration. Famous house journal of London, Gujarat Samachar hosted Rev. Swamiji’s discourse and question - answer session at Gujarat Samachar Bhavan. Sri. C. B. Patel, owner of the weekly welcomed Swamiji and thanked him for his graceful presence. After spending three days at Bristol (UK) and a stop by visit to Lester Rev. Swamiji departed for Ahmedabad , India. At Bristol he stayed with late Sri. Pranjivan Tailor’s family. Entire family was graced and blessed initially by late Sr. Swami Vyankateshanandaji Maharaj and later on by the Most Worshipful and Rev. Sri. Gurudev Swami Chidanandaji Maharaj. For organizing this entire tour to USA, UK, Canada and Amsterdam of Rev. Swami Sri. Adhyatmannadaji Maharaj, Sri Sivananda Ashram Ahmedabad and Sri. Divya Jivan Sanskrutik Sangh is highly thankful to all the organizers and devotees of Sri. Swamiji at all the centers. May God bless them all.